Two additional parcels have been received as part of the post-Irene Buyout Reuse program funded by FEMA – one opposite the Mill Pond at 2550/2528 Route 11 in Londonderry and one at 434 Main Street in South Londonderry. These parcels have been considered for low-impact reuse as the 'After the Flood 2' initiative. 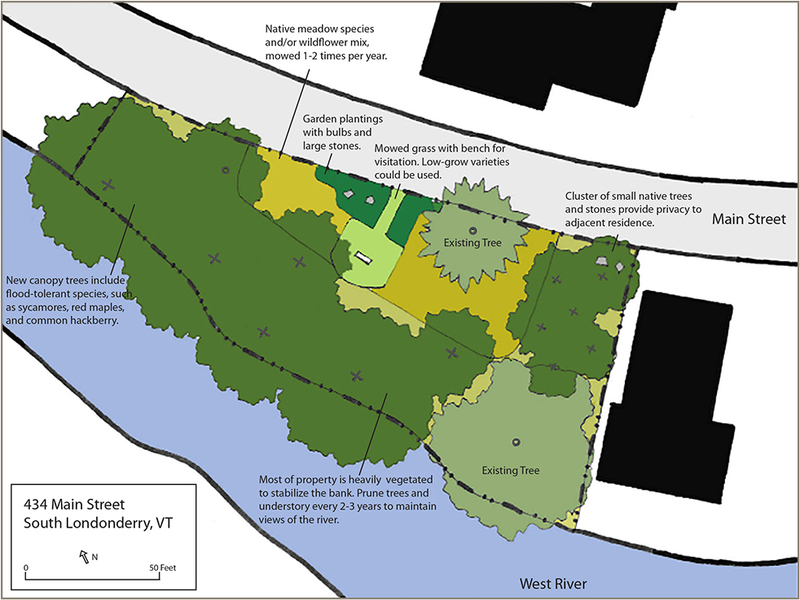 Concept plans have been developed by the After the Flood (ATF) Task Force in cooperation with Windham Regional Commission (WRC), and grant funding has been approved for 80% of the project costs. At this time, the ATF Task Force and the Londonderry Planning Commission would like to present the plans to the public and solicit feedback and comments to gauge support for the projects. There will be an Open House on Monday, April 27, 2015 from 5:30 – 7:00 PM at the Londonderry Town Office (Twitchell Building), with a short presentation and plans for viewing. If you'd like to leave feedback here on the website, please go to the Comments page. Click on either map for a full-size view. November's public meeting was impressively well-attended. After the presentations, there was a spirited exchange of views and ideas on flood control and dam removal, to the extent that discussion of reuse of the buyout properties was largely sidelined. In the aftermath of the meeting, the Task Force made a decision to shelve the dam removal discussion so that the focus could be placed on the potential for enhancing the buyout properties once the negotiations are complete (most likely early spring 2014). "To see if the Town will vote to support continued planning for the reuse and redesign of the five Londonderry buyout properties, beyond the minimum standards required by the FEMA HMGP buyout program, and to support seeking available grant funding options for final design, engineering and implementation." A 'YES' vote will let the Selectboard know that you would like to see the properties used in ways that benefit the town, beyond simple clearing/regrading. 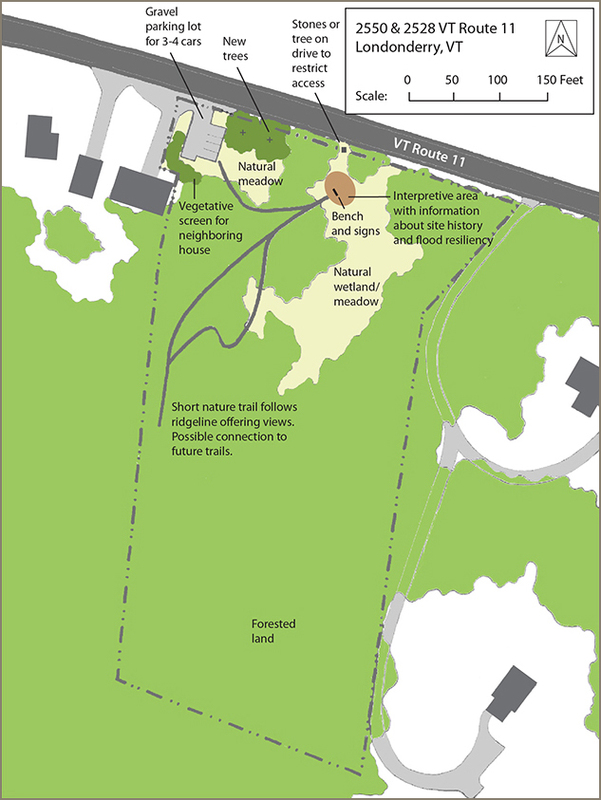 If the article passes, more detailed planning can be begin. The town can also start to look for funding from various grant programs. The article comes late in the warning for Town Meeting, so be sure to stick around to the end and vote YES! Complete video of November's Public Informational Meeting is available here on GNAT's website.